My beloved tablet died, so I sent it back to the manufacturer, just under the wire before the warranty expired. A friend had just returned my old netbook, so I moved my data over to that before sending out the sad tablet. After blowing a few large dust bunnies out of that machine it was only freezing up about once a day. 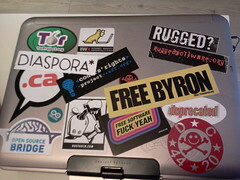 Ten days, one trip to California, two hackerspaces, and one keynote later, I had the tablet back. I was in a bit of a crunch at school so I didn’t have time to re-do the factory Win7 image exactly to my liking. So I popped the hard drive out of the netbook, replaced the tablet hard drive with the netbook drive, and got back to work. Everything* worked, everything was copacetic, and I was a happy camper with a full keyboard and pressure-sensitive pen tablet once again. It turns out being able to swap hard drives and have the machine just work is a pretty important feature for me. <3, Ubuntu**. *except for the BIOS only allowing certain PCI-IDs for WiFi cards… but that’s a story for another time. Manufacturers, please don’t do this. I’m looking at you, HP, Lenovo, Asus….